On Sunday, June 11th, Circle of Fountains met for our Primary-only advanced course and full moon ritual! The evening started with a Primary Member meeting as we'll be attending Gaea Goddess Gathering as a coven in September. We created a list of necessities for the four day camping trip and assigned them to individual members, splitting the responsibilities up to make the trip easier. Then Abby and I led a class about the Seven Principles of Hermetic Spellcraft. The lessons included a visual to help coven members process the potentially complex philosophy. We then headed to the ritual room where Phaedra led us in a full moon ritual. We then shared in honey mead as this is often considered the Honey Moon. Abby and I then continued our lesson about Hermetic Spellcraft by leading the circle in a warding visualization. Of course, the familiars joined us. After the warding visualization, Emily led us through a guided meditation. Abby and I then asked the circlemates to break down the ward into the seven principles so that they could clearly see them in action. I want to say that they all were incredibly on point and did us both proud! ... and closed the circle! Thank you so much to Phaedra for stepping in last minute to cover the esbat for this full moon! 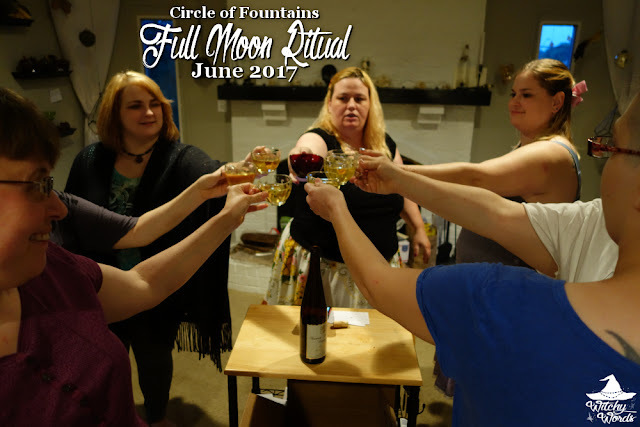 From my circle to yours, I hope everyone had a wonderful June full moon! That's cool you guys are learning about the Hermetic Principles. I saw your post recently about them on Pagan Bloggers. Very well written. I actually taught a lesson on the Hermetic Principles to an AP European History class last year. They were learning about the Scientific Revolution and their history teacher came down and asked if I could teach a lesson on it since I am a biology/anatomy teacher. These principles were well ahead of their time, and surprisingly accurate. I refer to them often when I explain to people how such a scientific person (my background is evolutionary biology and paleontology) can practice witchcraft. These principles are a great explanation. My husband and I went strawberry picking, and I made strawberry freezer jam to celebrate the full moon this month. The jam is so good. June 9th was actually the last day of strawberry picking at the farm we went too. I always forget the picking times in Georgia are significantly earlier than those up North.